The image of this entry was found in the heart of the Born which during the spring and summer months is overflowing with tourists experiencing the pleasure of getting lost (and hopefully not robbed) in the shady medieval maze which crisscrosses throughout the area between the Via Laetana and carrer Comerç, just before arriving to Ciutadella park. These days, I find fairly little new work on these streets, having lost myself in these streets hundreds of times over the last few years. At the end of October however, I stumbled upon this pasteup, which seems to be inspired by the work of pop artist Roy Lichtenstein. 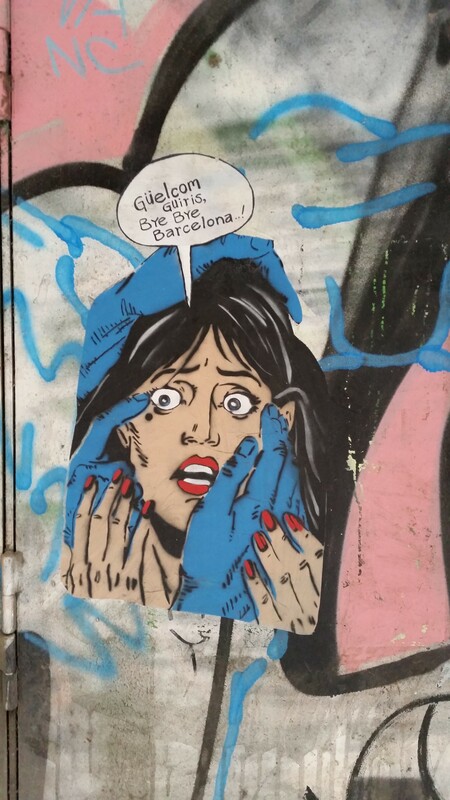 In it, we find a panicked woman, her face in a pair of beastly blue hands saying “Güelcom guiris, bye bye Barcelona”, which is a Spanish-ization of the words Welcome and “guiri” which is how the locals refer to the foreign tourists who descend upon the “ciutat comtal” in ever greater numbers every high season. The word “guiri” itself is supposedly a Spanish-ization of the words “where is…” which is a common phrase heard by locals when stopped by foreigners in search of Gaudí, Picasso, or the beach. Bye bye Barcelona seems to be a reference to a documentary of the same name, which criticises the management of tourism in Barcelona in which local culture, businesses and residents are taking a backseat to visitors and their money. I’d also like to extend my gratitude to two other blogs in which I am listed, Devour Barcelona Food Tours, and Velvet Compass. Both of these blogs should appeal to anyone interested in exploration and travel and are definitely worth a look.